KNAC.COM - Reviews - LYNCH MOB Live In Pittsburgh, PA With Photos! LYNCH MOB Live In Pittsburgh, PA With Photos! LYNCH MOB kicked off the first act of the set with four tracks from their debut (and most successful) album, Wicked Sensation. During these songs, two things became immediately apparent. First, they sounded like a real band rather than two original members working with hired guns; they were tight, well-rehearsed and convincing. Kudos to Sean McNabb (bass) and Jimmy D'Anda (drums) for providing an airtight and totally professional rhythm section. Second, Oni Logan sang like a man who had something to prove and sounded better than ever. His hard-rock/metal-tinged style brought to mind Paul Rogers (blues/soul influence) and maybe a touch of Dio (to explain the added aggression - not a surprise considering his recent work with DIO DISCIPLES). 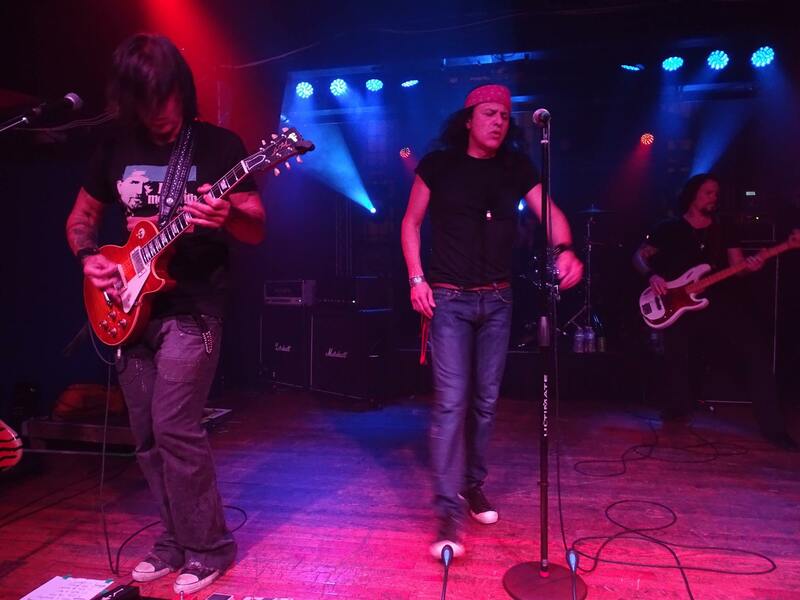 For their second act, LYNCH MOB moved into some of their more recent work with two tracks from the 2014 Sun Red Sun EP ("Subliminal Dream" and "Believers Of The Day"), followed by one from their 2012 full-length Smoke And Mirrors ("Let The Music Be Your Master"). This was the mid-section of the concert, and it served to bring things down a bit and gave everyone a chance to breathe. Clearly this was the material that the audience was the least familiar with, but they were solid songs with some interesting licks from George and some bluesy phrasing from Oni. The third act took the crowd back into full gear, featuring four DOKKEN tracks and LYNCH MOB's signature "Wicked Sensation". Lynch also turned in a particularly good rendition of "Mr. Scary", where he demonstrated that while his playing has changed a bit over the years, he has retained his signature sound as he expanded his arsenal of melodies and tones. George Lynch has done something that few guitarists ever accomplish; namely, developed an immediately recognizable style. In this respect, he's in a class with the likes of Yngwie Malmsteen, Eddie Van Halen, Stevie Ray Vaughn and Paul Gilbert ... and that's pretty good company. The sound was actually decent, with loud vocals and a crisp mix on the bass and drums. The only thing that could have been improved was the guitar level - seemed a bit buried. That's never a plus, but when it's a player of George's stature it's a real shame. LYNCH MOB didn't touch on any tracks from their upcoming Frontiers Music release Rebel, but it's worth checking out the "Automatic Fix" video as further evidence that the band is alive and well and have succesfully moved forward. This leg of the tour is over, but LYNCH MOB has a string of additional U.S. dates coming up in August-September. Check them out live and get that "Wicked Sensation". "She's Evil But She's Mine"